All documentation in one place, no more files on any disks. Searching for documents based on designation and content. docMaster is suitable for all kinds of document management within Project Management, Market, Product Data Management or Sales. Increase efficiency in all organisational units with docMaster by creating, changing, auditing, printing, approving and distributing all kinds of documents. 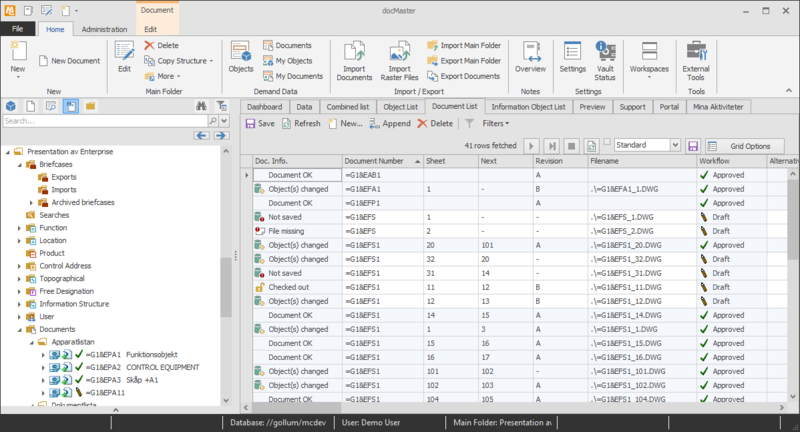 docMaster supports Office documents generated in Microsoft Office applications such as Word, Excel or Power Point and even more technical advanced documents and drawings such as CAD/CAE, 3D and BIM. Users kan be assigned to those rolls that give them right to inspect in project or operation apartment in which only part of organization may access to. Rolls also give users access to different features in program. premade template library which handles all document types such as system specifications, tender, protocol, test and calibration protocol as well as internal information such as Quality Management, Employees Documents, CV, Suppliers agreements, CAD and 3D models. docMaster maintains also quality standard like ISO9001 and keeps track of project document. Obtain a structure for your document management for companies’ intern business and even after project the way the document is delivered. Different stakeholders working in the same system.